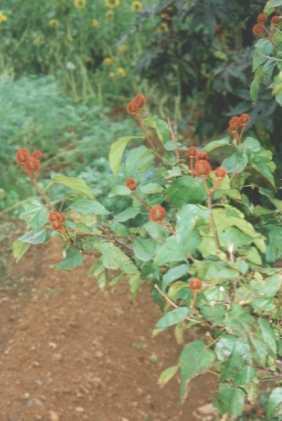 Dark red seeds (about 3 mm diameter). Pictures of both the seeds and the fruits are given by Ortiz. Bixaceae (a family with only two representatives in South America). Annatto has a weak, perfumed odour. The flowery scent of the seeds is caused by a tricyclic sesquiterpene hydrocarbon, ishwarane. South America; Brazil is the main exporter. Today, annatto is also grown on the Philippines (introduced by the Spanish). The name of the genus reflects the Carib plant name, bija or biché; orellana was given in honour of Francisco de Orellana, a scientist leading several expeditions to the Amazonas region. By confusion with the French town Orleans, the latter gave rise to the German name Orleanstrauch, literally meaning "shrub of Orleans". Other names of this plant all stem from Indio tongues in Central and South America: urucul from Tupi-Guarani in the Amazonas region, (thence French rocou), annatto from the Carib and achiote from Nahuatl in México. 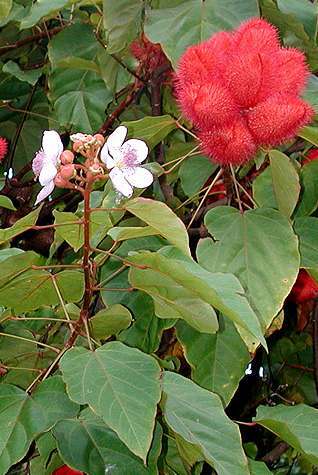 English lipstick tree refers to the cosmetic use of the plant. 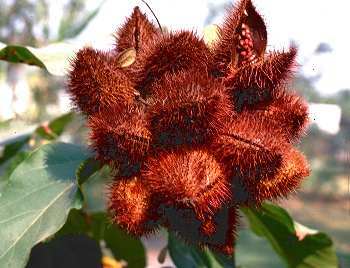 Annatto seeds are used in Latin America and the Philippines for staining food. In the Caribbean, the seeds are fried usually in (animal or vegetable) fat; after discarding the seeds, the then golden-yellow fat is used to fry vegetables or meat. On the Philippines, the seeds are more often ground to a powder and added to soups and stews. By these procedures, a golden yellow to brown colour is achieved. The original Aztec drinking chocolate (see also vanilla) is reported to have contained annatto seeds as well; given their high fat content, this is entirely plausible. Using annatto to deepen the colour of chocolate was common in Europe until the 17.th century; today, the spice has little if any significance and is used occasionally to give butter and cheese a deep yellow colour. In today's Asia, the seeds are not extremely common; they are mostly used in Philippino and Vietnamese cooking, but less so in China, where they are only occasionally contained in seasonings or marinades for grilled or fried meats (predominantly pork), resulting in a bright orange meat surface. In Vietnam, batters are often prepared with anatto oil to archieve a more attractive colour. In the Vietnamese version of Beijing duck (ga quay mat ong, can be prepared with either duck or chicken), the bird's skin is brushed with annatto oil, which results in a reddish-brown meat surface. Chinese cooks produce a similar colour by treating the duck with malt solutions, which caramelizes during baking. Although some books state that annatto imparts its specific flavour to the food stained therewith, I cannot myself agree with this opinion. It is true that pure annatto seeds have same very faint fragrance, but this aroma is not transmitted to the food. Orange or yellow hues can also be obtained with several other plants. A chemically similar dye is contained in saffron, and the colour may become quite similar; yet saffron with its incomparable fragrance is much more than just a colouring agent. Safflower, in contrast, does not have any taste at all and can, therefore, be used whenever colour is desired but no aroma wanted; but its staining capability is low. Lastly, turmeric has a strong, earthy aroma and stains food bright yellow. Both turmeric and saffron can even be used to dye textiles; both are, however, not lightproof (and saffron is very expensive, though this usage is mentioned in the Bible; see pomegranate). Leaves can also be used to colour food, but, in general, they will give only a modestly green colour (see pandanus leaves as an example). In the wild, leaf colours other than green are rare, but gardeners have succeeded in breeding cultivars with red or otherwise coloured leaves from many herbs and other plants (e.g., basil, sage or, most spectacularly, chameleon plant). In Japan, a purple-leaved variety of perilla is used to colour pickeled ginger. There are no easy ways to achieve other colours spices; several vegetables, however, fortunately can fill this hole. Spinach is common for green (because it is more colourful than most other leaves), tomatoes for red, carrots for orange and aubergines for purple. Italian cooks sometimes use the dark "ink" of squids to give their noodles (pasta) or rice dishes (risotto) an exotic black colour. Another, very unusual colouring agent is the dried cochenille bug, which gives a bright and appealing pink (appalling though the culinary use of an insect may seem). For those loathing beetles, the red beet is a viable and efficient alternative. Blue is the colour most difficult to achive by natural dyes; people have tried their luck with several flowers (e.g, borage), but apart from being only seasonally available, none has proved sufficient colouring capability.